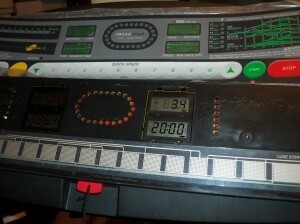 Pro-Form treadmill switch panel with overlay removed. 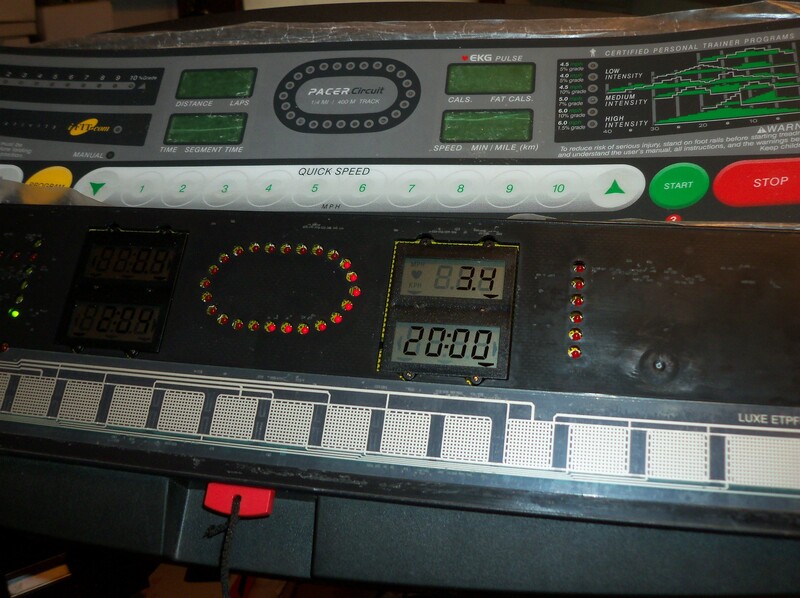 I have a treadmill that I stored and used on the back stairway. I may consider keeping it in the workshop where it’s been for the past week for repair. The back stairway is unheated, and worse, water from a good rain comes in through the upstairs neighbor’s back stair window. It’s not a good environment for a treadmill. I depend on it for those days when it is too snowy or rainy to go out walking. But this winter has taken it’s toll on the switch panel, and it stopped working. I had the panel apart once, and after cleaning and drying it worked again. Sometimes the switches seemed a bit stubborn, and I would push harder to force it to work. Of course, that didn’t have any effect, but that is the natural reaction. Finally last week, it stopped working altogether. I hauled the whole thing inside and had some partial success with another clean and dry treatment. Some of the switches worked, and if the working switches included the Stop button, I might have let it go for now. But the Stop button is nice to have, for instance when the phone rings or the legs start burning halfway through a program. The membrane flex panel assembly uses two layers of plastic film that fit in a depression about .030″ (.76 mm) deep. An extension of the panel serves as a cable, with 10 conductors. Between each switch are holes through which bumps molded into the plastic panel casing pass through the bottom membrane, and hold the top membrane away from the bottom to keep the switch in it’s “open” state. There are 17 switches. I started imagining repair schemes that would involve acquiring 17 push button switches, but that was quickly eliminated due to multiple factors. It would look awful and the switches would need to be located near, but not obscuring the labels on the panel. The 17 switches connect to the cable using 8 of the 10 wires and the other 2 are ground. So, it became evident that the switches are actually double pole switches, each (excepting one, the 5 mph button) connecting 2 wires to ground. I didn’t have any double pole push buttons laying around, and I would need 34 diodes to use single pole switches. I found the entire panel (“console” in Fitness Equipment lingo) at the Sears replacement part site, but it’s $150 and even if the cost were more reasonable, I hate replacing a whole unit when just a single component is broken. I spent too much time investigating some wild ideas that I would have implemented if I needed to. I could have eliminated the switch panel and substituted an Olimex PIC-MT board which has a Microchip PIC microprocessor and an LCD display and enough buttons to implement a menu scheme to get at the button functions. But I use the Olimex for different things and would probably need it again right after committing it to the treadmill. Another wild idea involved using Microchip’s mTouch technology to build a replacement switch panel. But that would take a while, and be expensive (I would need a large circuit board fabricated, at about $150), and it wouldn’t help me get the treadmill running right now. So, I looked for conductive pens, which I had heard of and never used. And I found Caig CircuitWriter, and it is available at Radio Shack, which qualifies it as a right now solution. I learned that it has a shelf life of 12 months unopened, and the fine young lady at the local Shack was kind enough to let me check that it had not dried up on the shelf. 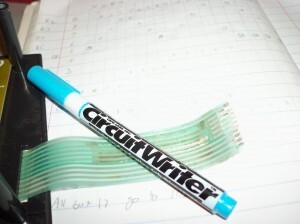 The CircuitWriter pen resting on the repaired cable. Background notebook has mapping of the key matrix to the 8 conductors. One thing I learned using the pen is to be patient. I started by touching up the fingers connector and learned that it is hard to control the width and thickness of the ink. The best thing might be to build up the trace in stages allowing it to dry some between applications. But, I ended up glopping too much on, and the traces were going to short each other. So, I soaked a paper towel in 90% alcohol and wiped off the ink. Along with the material that was the trace! I had to cut the flex back conforming to the odd shape it required. It was quite clumsy working with it, due to the 2 layers needing to be aligned and cut in a way that the conductors on the bottom layer traces face one way, and those from the top layer the other. Eventually I scraped enough of the oxide layer from the 10 traces to start forming the “fingers” with the conductive ink. After it dried enough (4 hours over a 40 watt lamp, though overnight is recommended), I tried it and 2 of the traces were still not working. More scraping of the outer layer (very carefully scraping only about 1/8 the width of the trace) allowed me to get a meter on the traces and isolate the breaks. After that, I scraped more around the break, and filled it in with more ink. The next morning, after a full drying time, I had no hopes of it working, but it did. It’s snowing and raining today, and I was able to get some walking on the treadmill, so I’m happy. I will investigate a protective coating for the cable and connector. Update: More bad weather and working indoors caused a need to start a workout a few days later around 8:30 PM. The treadmill is still indoors in the workshop and I had never really worked out on it inside. I was only about 10 minutes into a 30 minute session and I heard knocking on the door. The downstairs neighbor was not happy about the dishes and collectibles shaking on their shelves with me walking on the treadmill. So, I will need to put it out on the back stairway again, but am worried about more moisture damage. I don’t really understand the mechanism by which water damaged damage the cable in the first place, so I don’t know the best treatment to prevent it. I looked in my collection of paints and chemicals and couldn’t identify anything that might help. Today, at Home Depot, I found and bought Performix Plasti Dip in a spray can. Now that I’m home and writing this, and finding links for Plasti Dip, I learn that they make liquid and spray tape made for electrical solutions. I can’t find it on the Home Depot web site, so I’ll return it and find somewhere else to get it. Oh look! Harbor Freight carries it.